The edges have an annoying tendency to curl, but after re-starting for the 3rd time I gave up. It should be fine once baby is actually wearing it! It’s deliciously soft, and also machine washable, so hopefully Al and Kat will love it too. This week coming is a fairly normal one, until Thursday…which is my mate Theresa’s last visit to our office in Bristol before her maternity leave starts in a few weeks. I’ll really miss that chick, she’s always good for a laugh, and a lunch! But her baby will arrive sooner or later, so I guess some time off is now inevitable. 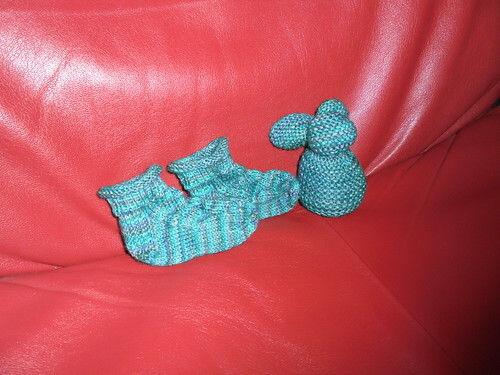 I must remember to take her knitted elephant in with me, as it’s my last chance to hand him over. Then I’ll probably send something to her in Plymouth when baby has arrived. I’d like to go down there and visit, but that’s only if money allows. 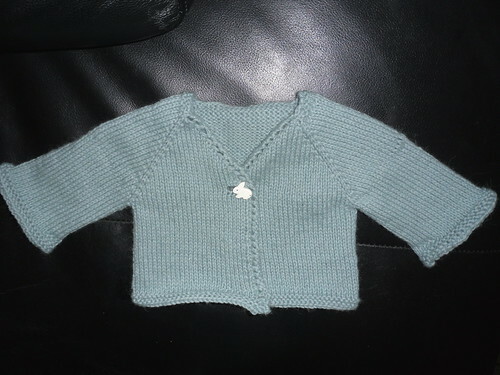 This entry was posted on February 26, 2011 at 6:13 pm and is filed under knitting. You can follow any responses to this entry through the RSS 2.0 feed. You can leave a response, or trackback from your own site.